The People’s Republic of China has created the largest unconditional cash transfer program in the world. It is called dibao, meaning Minimum Livelihood Guarantee. A recently published book is taking a fresh look at how effective dibao is at improving the livelihoods of impoverished Chinese people. Dr. Qin Gao is on the faculty of the Columbia University School of Social Work, where she researches poverty, income inequality, and social welfare programs in China. 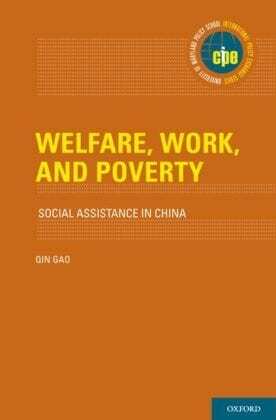 Gao has done extensive work researching dibao, and has released the book “Welfare, Work, and Poverty: Social Assistance in China,” which evaluates how well dibao has achieved its goals of lowering the amount and intensity of poverty in China. The UBI Podcast recently interviewed Gao on her new book about the dibao program and asked her to give her thoughts on universalizing dibao. Dibao is important to understand for basic income researchers because it demonstrates on a large-scale how basic income operates when it is not universal (since it includes a means test). The dibao program allows each locality to set its own dibao standard (essentially the poverty line). Anyone below that standard is technically eligible for dibao assistance. The assistance in theory gives an individual enough money to reach the dibao standard. Eligibility for dibao is based on individual income, so one individual in a household could qualify, while another may not, Gao said. For example, a dibao standard in Beijing, China is 900 RMB per person per month. If an individual made 700 RMB per month, dibao would provide 200 RMB in assistance to reach the dibao line of 900. While some may worry that officials will cut off dibao assistance once an individual goes over the line, Gao said the reality is more complicated. “In reality, many local officials are very considerate of the fluctuation in people’s incomes and other family situations. For example, education needs, health care needs. So many localities actually have initiatives to not discontinue people’s dibao benefits right away if they have income that’s higher than the local dibao line,” she said. Once a family receives the cash, it is unconditional, meaning there are no (direct) behavioral conditions to continue receiving the money. Gao said the evidence that dibao creates a poverty trap, where families remain under the poverty line intentionally to receive assistance, is not strong. Some localities have families update their income and wealth information every three to six months. Certain villages will even publish the names of recipients to allow for public feedback on whether a family should qualify for dibao. Based on the feedback, localities will randomly select people to verify their income information. “So it’s a very systematic and stringent process,” Gao said. For some villages, allowing others to comment on a family’s poverty situation may further stigmatize the dibao and other forms of welfare. “Because the dibao is an unconditional cash transfer, so by design the policy requires applicants to tell the truth and other community members and neighbors to share the responsibility of monitoring. That is part of the design of this program,” Gao said. While on paper, the dibao is technically an “unconditional cash transfer,” the way dibao measures wealth creates its own form of conditions. Depending on the locality, dibao recipients may face a myriad of asset tests that prevent them from owning pets, a larger than average home, a car, or luxury items. Expensive private schools and schools abroad are off-limits. In the past, even a cellphone was a disqualifier. “I think now, many localities are more lenient on that, especially on the cell phone. But there are certain luxury goods (so-called), that you’re not supposed to have. That also features into the feedback from the neighbors and community members. They would get critical and jealous if you have certain luxury goods that they don’t have but you are getting dibao,” Gao said. In Gao’s book, she also analyzes the subjective well-being and social participation of dibao recipients. She found dibao recipients “tend to be more isolated, and less active in their social participation” than similar peers. Dibao recipients may feel stigmatized from participating in these activities, such as going to the movies, since it is not a “culturally acceptable use of the dibao income,” she said. After China’s transition from a planned economy to a market-based economy, society’s expectations about how families earn their own living changed. Now it is expected that people “earn a living through their own work.” Although, Gao said China is currently going through a debate about who “deserves” welfare. “Previously people had guaranteed jobs, but many people during the economic transformation were laid off so able-bodied adults couldn’t support themselves through jobs anymore. And that group is making up about half of the dibao population,” Gao said. “The targeting error is real and local officials are very aware of it, but that will stay with the program because of the variations of family conditions and income,” Gao said. The dibao standard is often used as a criteria for other welfare as well. This means that qualifying for dibao also gives a family access to a host of other assistance (including education, housing, and medical assistance). However, this could create a “welfare cliff” issue, where if a family exceeds the standard they may lose a lot more assistance than they gain as income. “I think this is one of the policy design features of dibao that needs to be revised right now,” Gao said of dibao acting as a “gatekeeper” for other social assistance. Overall, dibao has only reduced the rate of poverty to a “modest degree.” It is more effective at reducing the depth and severity of poverty, Gao said. “I think the best possibility probably would be for certain more developed localities to experiment with such a program and see how it works,” she said. As for creating a UBI program in China in the near-term, Gao said this would be challenging for many reasons. “To make the dibao or a similar cash transfer universal all around China, I don’t think it’s very likely in the short-term, both in terms of fiscal challenges and also political and cultural challenges,” Gao said. -please clarify this – largest in terms of budget or number of beneficiaries? Largest in terms of absolute numbers, which reached over 70 million total in 2015.
how many villages and recipients there are now in dibao’s program? dibao is good but is there an age limit to receive dibao? Take for instance if everyone receiving basic income is entitled to dibao by adding to the person’s income: what of the people that do not have income at all?